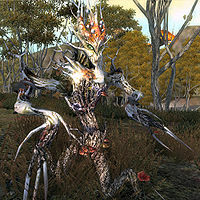 The Gnarl, or "Walking Tree" as it's sometimes called, is one of the strangest creatures. Like the Elytra, this animated plant can be found roaming almost anywhere on the Isles. 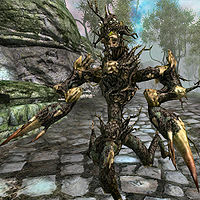 One of Sheogorath's truly unique creations, the Gnarl has the most unusual trait of being able to use magic cast upon it, and harness that power to bolster its own defense. Once struck with fire, frost or lightning, the Gnarl grows physically larger and becomes resistant to just that element for short time. 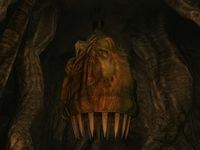 Interestingly, this is where the Gnarl's vulnerability comes into play. At the same time the Gnarl is resisting that element it was struck with, it becomes vulnerable to all of the other elements. This is easily exploited by throwing a simple spell of one element at the Gnarl, then following up with a more powerful spell of a different element. * These values are dynamic. They only come into play when the Gnarl is hit by an elemental damage spell. These Gnarls are only found in The Fountainhead, beneath Sheogorath's throne. They are not hostile and play a part in The Roots of Madness. They can be spawned from Gnarl Chrysalises found throughout the Fountainhead. 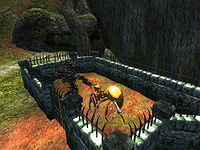 Gnarl Prisoners are only found in Blackroot Lair, where they have been imprisoned by Grummites. By default, they will be non-hostile towards the player. This page was last modified on 22 January 2019, at 23:35.